At the Astrobiology XIII session, 3-5 August 2010, of this year's SPIE conference in San Diego, NASA scientist Richard Hoover showed images that add weight to the case for fossilized cyanobacteria in meteorites. The fossils are found in carbonaceous meteorites of several types, including CI1 (example: Orgueil) and CM2 (example: Murchison). Here we present some typical and previously unpublished images from those meteorites. That the microfossils are the remnants of biological, once-living organisms is apparent from looking at them. Most resemble well-studied and recognizable filamentous cyanobacteria which are aquatic organisms long known as "blue-green algae." These life-forms are among the dominant photosynthetic life forms in the oceans and lakes, but they also inhabit the polar ice caps as well as permafrost, geysers and volcanic fumaroles. These abilities make cyanbacteria ideal as potential life forms that could conceivably grow in the permafrost of Mars, the ice of Europa or in liquid water veins beneath the jet-black crusts of comets as candidate microbes that could conceivably be distributed throughout the cosmos by the agency of panspermia. 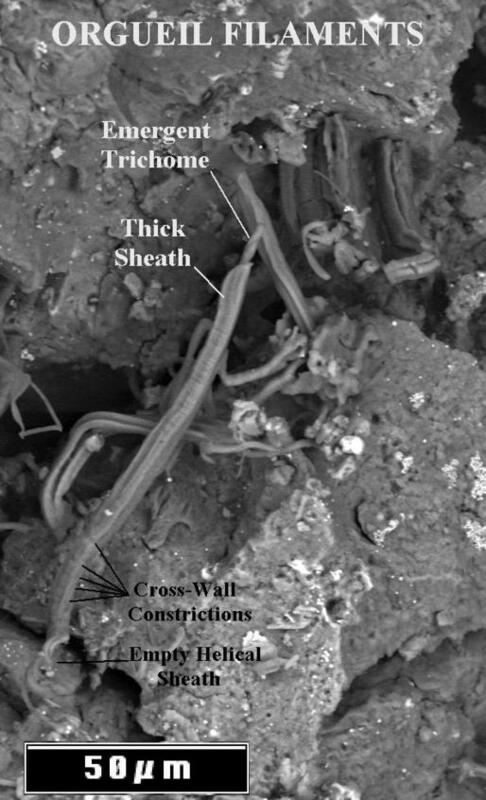 Chemical mapping shows that carbon and other life-critical bio-elements are distributed in the forms as appropriate for biological fossils, but the filaments are also infilled with Epsomite (hydrated magnesium sulfate), which was deposited in the hollow sheaths after the organisms died. Amino acids, nucleotides, and other life-critical biomolecules are found in the same carbonaceous meteorites that contain the fossils. The excess of L-amino acids, a property of the proteins in all living organisms known, is consistent with life — and with no known explanation by abiotic production processes (which yield equal numbers of the D- and L- forms). Clearly, the fossils found in the meteorites are biological. The major question is — were the microfossils present in the meteorites when they entered the Earth's atmosphere, or were they left by modern microorganisms that entered the stones after they landed on Earth? The Orgueil meteorite was observed to fall in France in 1864. It is one of only five extremely rare CI1 meteorites known on Earth. These very precious stones have always been carefully curated in museums in sealed containers, since it has been known since 1806 when the Alais meteorite fell that the stones rapidly disintegrate when exposed to water or to a moist atmosphere. On the other hand, some of the more substantial samples of the Murchison CM2 meteorite, which landed in Australia in 1969, were merely stored in boxes in museum drawers. Hoover (1,2) previously described many of the indigenous microfossils in the Orgueil and Murchison meteorites in detail. 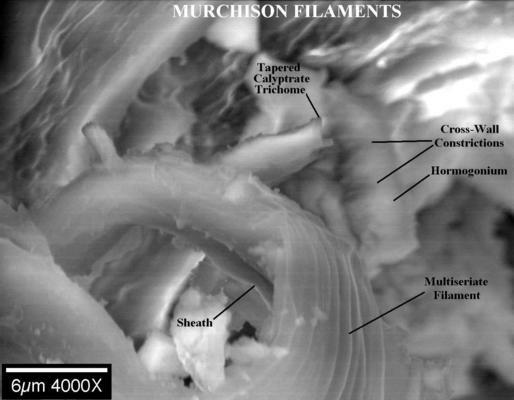 He also reported one Murchison sample that had been contaminated after arrival on Earth by filamentous fungi that can grow on fairly dry substrates. The modern fungal contaminants were pale blue in color and they contained the high levels of nitrogen (2-15% atomic) found in all modern organisms. Furthermore they moved and were damaged by exposure to the Electron Beam (consistent with the responses of living or recently dead cells) of the Field Emission Scanning Electron Microscope. This was clear evidence that they were modern contaminants. However, this was the only case of fungal contamination that has been encountered since 1996 when Hoover and his collaborator, Academician Alexei Yu. Rozanov (Director of the Paleontological Institute of the Russian Academy of Sciences in Moscow) began their studies of microfossils in carbonaceous meteorites. Elemental analysis by Energy Dispersive X-Ray Spectroscopy revealed that the permineralized cyanobacterial fossils discovered by Hoover typically had nitrogen and phosphorus levels below the EDS detection limit and carbon/nitrogen, carbon/sulfur ratios that were consistent with ancient (but not modern) biology. Furthermore, the fossils of "blue-green algae" (cyanobacteria) that Hoover discovered in these meteorites are aquatic organisms that grow only during total immersion in liquid water on Earth. If the Orgueil meteorite stones had been immersed in liquid water after landing on Earth, they would have disintegrated. Therefore, the contamination argument against them rings hollow. The Murchison meteorite was seen as it fell in Australia in 1969. Some of the fragments were gathered immediately and were too hot to touch — others were later found with frosting on the fusion crust. This indicates that only a thin layer of fusion crust became hot and the ice cold interior remained frozen during the short time the meteorite fireball came through the upper atmosphere (similar to the blazing entrance of an Apollo capsule with the Astronauts inside). During his presentation at SPIE, Hoover pointed out that these meteorites contain not only microfossils, but chiral amino acids that are a distinctive signature of life. However, only eight of the twenty protein amino acids and three of the nucleobases needed for life are found in the meteorites. If these stones were contaminated by microorganisms after landing on Earth, then they would contain all twenty amino acids and all five nucleobases would be present and the filaments would have clearly detectable levels of nitrogen and phosphorus. He also pointed out that the amino acids that are missing from the meteorite are present in 40,000 year old Pleistocene Mammoths, but they are also missing from 65 million year old bones of Dinosaurs. 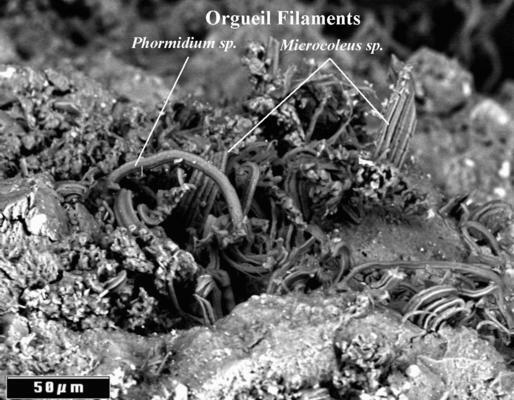 He concluded that the filaments found in these meteorites provide clear and convincing proof for the existence of extraterrestrial life and support the hypothesis of an exogenous rather than an endogenous origin of Earth Life. In both the Orgueil CI1 and the Murchison CM2 meteorites, fossils were discovered in freshly fractured interior surfaces of the samples and often embedded in the rock matrix of the meteorites. Furthermore, 2-D elemental maps of the fossils show that the chemical distributions within the fossilized filaments are distinct from those of the meteorite matrix and are consistent with ancient fossils of biological life forms but inconsistent with recent contaminants. For example, unlike recent contaminants (but like ancient fossils on Earth), they are depleted in both nitrogen and phosphorus and often have unusually high content of magnesium, sulfur and carbon. The CI1 and CM2 carbonaceous meteorites are likely the fragments of spent comets, which are largely made of water-ice with regions on their jet-black surface that get very hot (~400 K for Halley at 0.8 AU) as their orbit carries them closer to the Sun than Earth is. Hoover argued that during these periods, meltwater and complex organics and minerals within the nucleus could very well support rapid growth of cyanobacteria and other microbial extremophiles. The whole story fits together very neatly and provides observational evidence in support of the concept of panspermia and the hypothesis that life is not restricted to the planet Earth alone, but may be widely distributed throughout the cosmos. Thanks go to Gregory Jerman and James Coston of NASA/MSFC for Scanning Electron Microscopy support, and to Academician Alexei Yu. Rozanov for a long and fruitful collaboration with Dr. Hoover. Is there life in space? is the subject of Hoover's thoughtful letter to Swedish seventh-graders [transcript.doc], 15 Nov 2011. 9 Mar 2011: Evidence for fossilized germs in carbonaceous metorites is too hastily dismissed. 24 Sep 2010: "Seeking Signs of Life" is an upcoming symposium where this evidence should be discussed. Hitchhiking Bacteria Ride Meteorites to Earth, by Marcia Stone, Suite101.com, 21 Sep 2010. 24 Aug 2010: Bacteria similar to Gloeocapsa cyanobacteria survived 553 days' exposure to space. 15 Aug 2010: our What'sNEW announcement of this webpage, with links to earlier evidence from Hoover. Search for Microfossils in Carbonaceus Chondrites, by N. Krestina, M. Petaev and S. Jacobsen, 41st Lunar and Planetary Science Conference, 1-5 Mar 2010. 2. Hoover, R. B. "Microfossils in Carbonaceous Meteorites" [abstract], doi:10.1117/12.832643, SPIE 7441, (2009). 3. Figure and caption courtesy of Richard B. Hoover, Aug 2010.